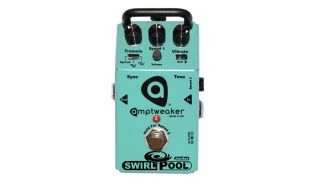 NAMM 2019: US pedal/amp-building firm Amptweaker has announced a newly shrunk version of its popular Swirlpool tremolo/vibrato pedal, the Swirlpool Jr. 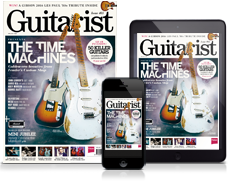 The new pedal is less than half the width of the original and packs a huge amount of the original's tonal flexibility into its compact footprint. The true-bypass footswitch can be held to move to a second speed setting, while mini switches beneath the Tremolo and Vibrato controls allow you to alter the LFO settings and vibrato types. There's also an input gain and master volume control. As with its bigger brother, the Swirlpool Jr. is made in the US. There's no word on pricing for the new pedal, but Amptweaker is inviting those interested to register for their pre-order mailing list, which will notify you once the new pedals are shipping.